Kanaan breaks 217. 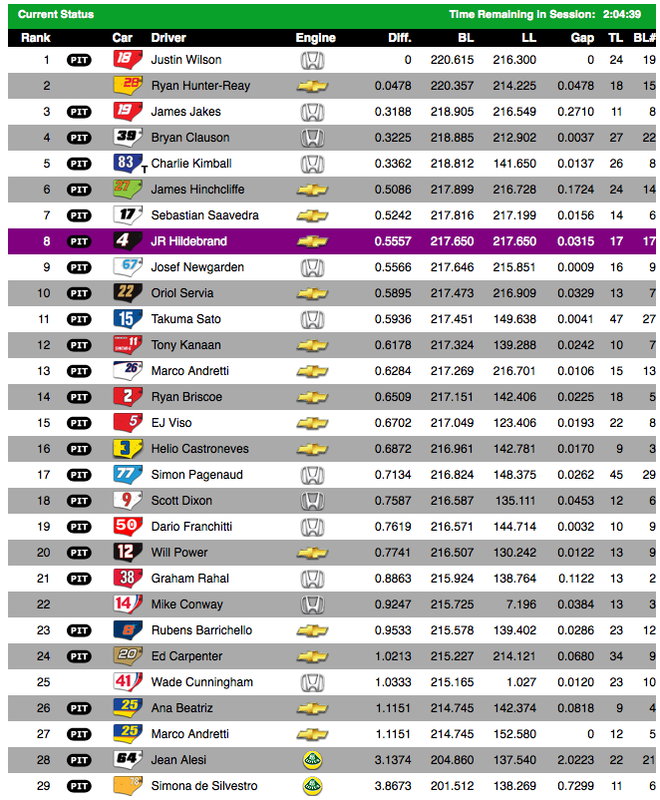 Newgarden was doing 218s by himself. Fastest single car so far. He pits now. Marco Andretti is driving the #17 for Sebastián Saavedra. That car is a joint effort between Andretti Autosport and AFS Racing. Used to be Kanaan's job to set everyone up; last year, John Andretti did that. Marco's all grown up now! No one's been doing as much work today as Newgarden. Out there again. Kanaan: 217.228. Servià: 216.835. Both pit now. Newgarden is the only car on track now. Alright, Indiana: when you go to a bar, you say "I'm going to the bar" not "I'm going to the bear." Think about that when announcing Barrichello. Rubens is on the track right now, as is Kimball. Castroneves was a buzzkill. Never broke out of the high 213s. High 217s for Kimball in single-car running. He's dead consistent. 217.698 last lap, 217.699 this lap. Ed Carpenter paced Opening Day last year in the 224s with Sarah Fisher Racing. He's out in his own car, the Fuzzy's Ultra Premium Vodka Special, now. Considering the equipment he's driven, he's arguably the best oval racer in this series but he runs it waaaaaaaaay wide out of two and that's enough to send him back to the pits before he really gave the car a go. Loose, loose, loose. Newgarden and Clauson are still on top. Looks like a single car can't go much faster than 218...keep in mind they will have 45 more horsepower or so for qualifying. Penske Chevrolets are only in the 213-214 range. Not sure what kind of runs they're doing today, but they aren't going for the money that you get for pacing Opening Day, at least not yet. Honda looking stronger today. None of the heavy-hitters at the top yet. Cool stuff. Still haven't seen the lone eligible Lotus, Simona de Silvestro's HVM entry, on track. I'd love to see how it compares to Alesi's times. Jean Alesi is allegedly going to be on track at some point. I'm not sure how. He never finished orientation. 20 of 27 cars have practiced; Marco Andretti and Sebastián Saavedra have both been in the 17. I forgot that Townsend Bell was running the ALMS race in Laguna Seca today, and therefore, the 99 won't debut today. Getting to the end here. Alex Tagliani has a Honda engine. 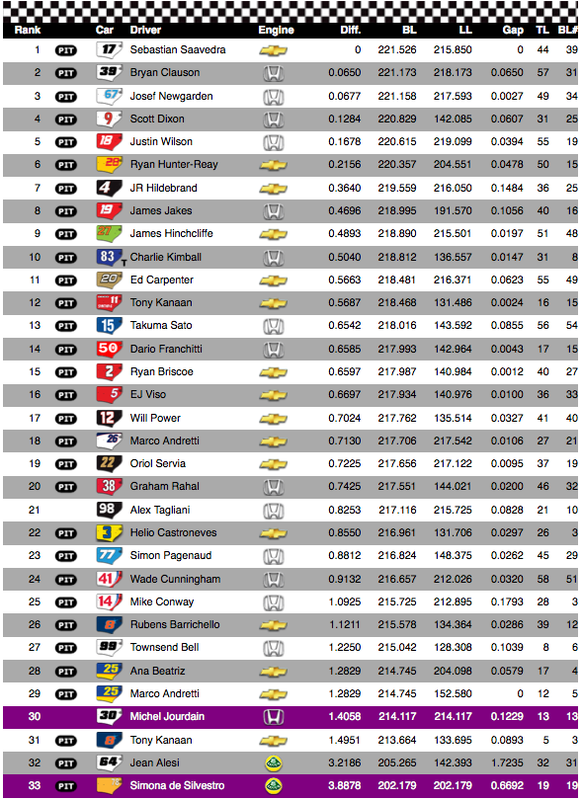 Newgarden leads at 220.250. Hildebrand, Jakes, Clauson, Kanaan the top five. Kimball, Castroneves, Pagenaud, Wilson, Dixon the next set of five. Two slowest cars of the day have Lotus engines. Alesi did a 209.188, his fastest ever. De Silvestro went 197.414. Yikes. Two cars on pit lane with no time: Alex Tagliani and Marco Andretti (in Ana Beatriz' #25 now, after driving the #17 a few times). Cunningham's lack of pace in orientation seems to be a team thing. Conway's not exactly lighting it up out there. Not a huge surprise there. What is surprising? How far off the pace Ed Carpenter has been. Between himself, Derrick Walker, and Vision Racing, they should be getting this together. Perhaps they're trying non-qualifying things out. It's only one session, after all. Marco's taking Ana's car out now as Servià does his best of the day: 217.049. That puts him eleventh, he'll hold eleventh now as he goes up to 217.199. Tagliani and de Silvestro heading out now. Andretti brought the car back in before completing a lap. The Lotus has a very distinct noise to it. Simona does a 200.203. Her best of the day. It's tough for Lotus to have Alesi and de Silvestro as their drivers. The engine itself is crap, but neither driver is exactly an Indy 500 ace. Still, I'm glad to see their talented lineup all move on. Servià, Tagliani, and Bourdais deserve better (and that doesn't mean Simona or Jean don't, they're just not immediate priorities. Certainly, if anyone deserves a Lotus, it's Legge). Tagliani just did an installation lap, nothing for time. Alesi in the 207s, Simona in the 200s. Not sure why, but the DW12 looks extra bad in red. Other colors aren't as offensive, but red, man, stop painting these cars red. Takuma Sato shows up on the pit road with 12 minutes to go. Clauson to third with a 218.834. SFHR and Honda seem to have something really nice today. Good for Clauson. Great story. He's reeling in Briscoe, might get a tow. Newgarden's 220 was with one. Newgarden was also very fast as a single car, in the 218s, which I think is the peak for the cars in this package (they will, as I've said, have extra horsepower for qualifying and hopefully gain a few mph from that). Clauson: 219.632, still third. He and Briscoe exit the track, which is now empty. Ten minutes to go in Opening Day. Tagliani's on track now with his Honda. 208.396 on his first flyer. See if he goes for another...he does, 212.254. His car, the #98, won last year doing a partial program (didn't participate in many of the practices). Surprised they're here on Opening Day, since the Honda engine was never confirmed. 212.840 now. Five minutes to go. Looks like Sarah Fisher will get her second consecutive Opening Day as a team owner. Ed Carpenter paced it last year in the #67. Carpenter went on to qualify within the nine drivers eligible for the Pole Shootout, so having pace on Opening Day can be somewhat meaningful. 213.696 for Tagliani, that's his best. No change of position for him though. Alesi, Conway, Tagliani on-track to end. 214.161 for Tagliani, now up to twenty-first position. Tagliani got caught behind Alesi; despite the tow, he had to slow down significantly to accomodate, and ended up slower in the draft than he had been doing his single-car runs. Sato's debut: 214.369, up to 21st. Tagliani does a 215.344 and jumps to 18th, Sato back to 22nd now. Conway and Alesi do their fastest of the day. Alesi has not yet passed rookie orientation. Sato: 216.854, he's P13. Only took him three laps. 217.180 for Sato, now he's P12, and that's it. Checkered flag...Josef Newgarden has a 100% record in Indy sessions. Teammate Bryan Clauson in third. What a story. Practice again tomorrow noon to six, racecontrol.indycar.com to watch, I probably won't be updating as much. Dragon Racing have not made any progress on an engine. Don't expect to see them tomorrow. Engines are leased at a loss to the supplier. The loss is supposed to be made up for by marketing benefits (which don't really exist when no one watches, but...). They did this so it was cheap for teams; that made it easier to get high grids at normal races. But at Indy, the more engines you run, the more of a loss you're getting, and Indy's the only race with any marketing benefit whatsoever, so they want to do this as low-cost as possible. Hence they aren't willing to open up leases to teams, and I certainly suspect they conspired to not have more than 33 because a lease that FTQs is a big loss. Aerokits will also be leased at a loss to the supplier. Not a lot of suppliers jumping up and down to do that, but that's a way from now. What matters now is that we only have 29 entries that 1) have engines and 2) have drivers who have passed orientation. Huge surprises in the top four so far. Three and a half hours to go. Justin Wilson is on top at 220.615. He did that lap with a huge tow from J.R. Hildebrand. His teammate, James Jakes, is second: 218.905. Bryan Clauson and Charlie Kimball complete a Honda sweep of the top four. Not the names I expected to see on top, though there's still a long way to go. 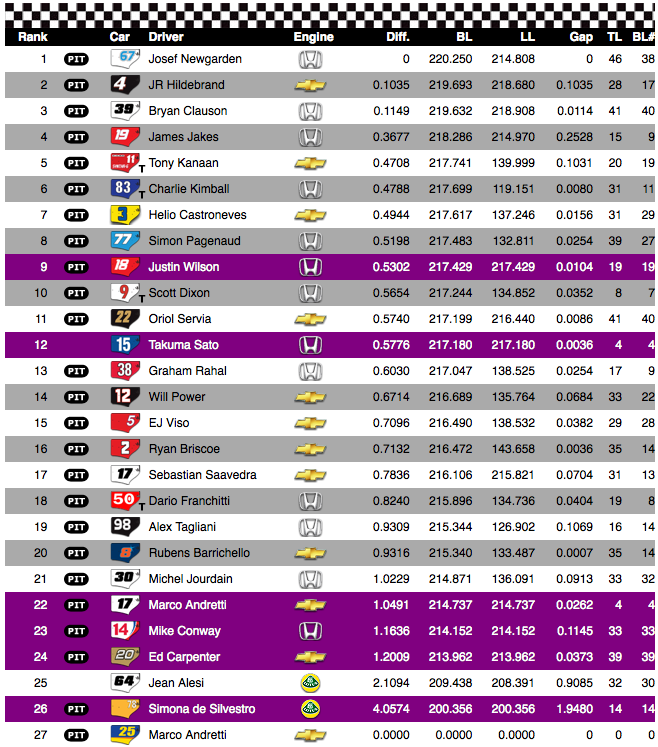 Hunter-Reay, Hildebrand, and Saavedra take the next three spots for Andretti. Rounding out the top ten currently: Hildebrand, Newgarden, and Servià. No Penske or Target Ganassi cars in sight. I like that. Ana Beatriz is heading out; Andretti drove her car earlier. Jean Alesi is slowest. 204.860. Simona de Silvestro is yet to turn a lap. Wade Cunningham ran today. His fastest time is 215.165, which puts him twenty-third. I assume he passed the third phase, but I don't know yet. 194.244 after two laps for de Silvestro. Jean Alesi's faster than her. Time to find a series without ovals. And a co-driver to carry her. Grand-Am beckons. Green flag back out and we're going...well, we aren't, I personally am not, and no one else is. Ana Beatriz in the #25: 214.745. Marco Andretti in the #25: 214.745. Car's pretty consistent, eh? Cunningham passed rookie orientation. Good for him. I figure IndyCar will give it to Alesi if he keeps running steady. It's becoming evident that a Lotus-engined car isn't capable of going over 210 mph. Alesi's been solid. Not a hazard for his driving. I'd approve him. Better than Simona so far. She goes to 200.571 now. About what she was doing yesterday. Times right now. I know, I know, it's practice...but it's the Indy 500. And I like any session where Penske/Ganassi aren't on top (I guess Kimball doesn't count as Ganassi to me, since he's never been very successful). As I've said before, I'll be very happy if it stays like that for the race. Wilson to win! Are you watching crappy regional news programme?! In a race, Wilson won't be the only guy with a tow. We have 10 minutes to go. Sebastián Saavedra is fastest. 221.556. Getting quicker. Teammates Bryan Clauson and Josef Newgarden are second and third. 221.173 and 221.158 for those guys. Dixon and Wilson rounding otu the top five. Simona de Silvestro is 20 mph off the pace. She's just plain dangerous out there. Tony Kanaan was in the #8 for Rubens Barrichello. Back in his old role as setup guy. Ironically, his setups never really worked for his teammates. Patrick felt much more comfortable in 2007 with Franchitti's setup than Kanaan's in 2008+. Wilson has a huge tow from Newgarden. Should lay down a quick one...nope. Only 219.099. Had an absolute monster of a tow. He'll need to be a little quicker than that. Carpenter (P11) and de Silvestro (P33) out with five minutes to go. Ed doing 216s all alone. That's alright. Not the fastest I've seen a single car do, but better than yesterday. Big progress for the ECR/Walker/Vision boys. Simona goes purple. That's 202.179. Embarrassing engine with a not-that-great driver. Bad combo. Tagliani and Jourdain out for the senior circuit...and Tagliani pits without doing a lap. I think I've figured the DW12 out. Solid color livery: awful. But with a design, it's not too bad. Especially on the nose; there needs to be some sort of trim or something on the nose. I hated the chrome noses on the Andretti cars last year, but this year, they actually help. Jourdain does his best of the day. 10 mph plus off the pace, it's 211.267. Tagliani's back out. I wonder if he's doing pit stop practice? Hard to tell. No, he stays out now, one minute to go. 213.679 for Jourdain, best of the day for him. Tagliani and Jourdain will take the checkers this time around. 214.117, Jourdain ends with his daily best. Tagliani ends at a 215.725. He had been quicker earlier. That's it for day two.